At Sunshine Weddings Spain we are lucky enough to get to plan weddings for couples all over Spain, and one of our favourite destinations is the Iberian island of Mallorca. We first spoke to Lucy back in October 2014 when her boyfriend Antoon had proposed to her. They had always loved the pretty island of Mallorca and couldn’t think of a more perfect place to get married. Mallorca offers bridal couples everything they need for the ideal Mediterranean wedding; magnificent mountains, rolling countryside and traditional Spanish rustic venues ideal for couples wanting their perfect wedding in Mallorca to reflect the essence of Spain. Plus the stunning turquoise waters and pretty private coves ensure that whether you marry at a fancy beach clubs, rustic villa or luxury boutique hotel, you are always guaranteed a pretty backdrop for your wedding photos! Lisa, our Mallorcan wedding coordinator, met Lucy at our offices in London. She discussed her wedding requirements at length and we put together a schedule for Lucy & Antoon’s complimentary Venue Tour of Mallorca. Not only is this part of the wedding planning fun, but it’s also vital that the couple see the huge array of wedding venues that we can offer in Mallorca. Lucy and Antoon wanted to get married in a rustic Finca, so we showed them around three of the best, all slightly different but equally breathtaking. 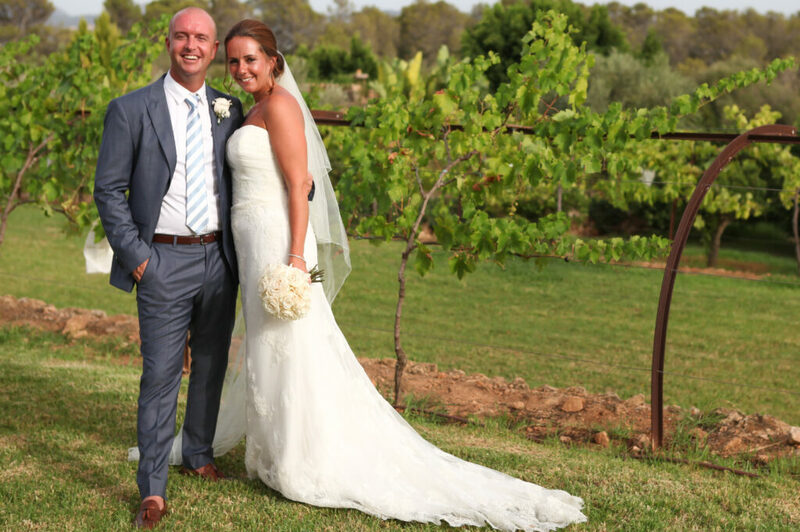 With three lawns, two courtyards, two options for the evening party and a huge marquee for larger weddings, their chosen Finca was the Mallorcan wedding venue that dreams are made of. As well as stunning grounds, the Finca also boasts five brand new double bedrooms, some with en-suite bathrooms, as stunning as something from a five star boutique hotel. As this was going to be their only trip to Mallorca before their big day, we also organized a day of food tasting. Had they not already made up their minds, this was the clincher! Once having tasted the venue’s Michelin star meals, they were 100% certain that they had made the right choice. So Lucy and Antoon raised their glasses and toasted their new wedding Finca and August wedding the following year. Find out in Part 2 what fun the couple had planned for their big day!